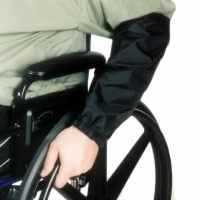 The items here are made to keep your clothes clean and your body warm as you travel in your power wheelchair or mobility scooter. 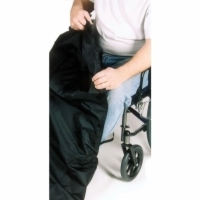 SleeveGuards protect the sleeves of your clothing against dirt and grease that can be picked up while operating your chair. Sized to fit the average adult, put them on by simply sliding your feet into the bottom pocket and slipping them up over your legs. Sized to fit children, put them on by simply sliding your feet into the bottom pocket and slipping them up over your legs. Sized to fit larger adults, put them on by simply sliding your feet into the bottom pocket and slipping them up over your legs.